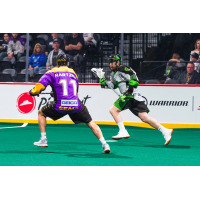 San Diego, CA - A six-point night from Ben McIntosh and a 43-save effort from Adam Shute weren't quite enough for the Saskatchewan Rush on Friday night. The San Diego Seals (8-5) needed three clutch saves from Frank Scigliano in the late going to hang on for a 13-12 victory over the Rush - a win that kept the expansion franchise atop the NLL's West Division. The second-place Rush (6-6) clawed their way back throughout the game and pulled within one with over six minutes to go, but couldn't find the equalizer. They had their chances, but were thwarted by Scigliano in the late stages. Scigliano's best save came with three minutes left in the fourth quarter when he closed the gap to prevent Rush transition Travis Cornwall from beating him five-hole on a breakaway. With 1:20 left, the veteran netminder turned aside Jeff Shattler's chance on a partial break, and Scigliano finished off the Rush when he was able to hold onto Robert Church's hard shot from the slot with 30 seconds to go. The Seals held a 4-2 lead after the opening quarter, but saw that narrowed to one early in the second when Matt Hossack scored a breakaway. However, San Diego responded with a three-goal run, including back-to-back goals from Kyle Buchanan. The Rush weren't about to let the home side take control, though, as Jeremy Thompson fired a shot over Scigliano's shoulder with 48 seconds to go in the first half, and with just 1.3 seconds left, Ryan Keenan finished a terrific passing play with Mark Matthews and McIntosh to make it 7-5. Rush captain Chris Corbeil brought his team within one only 10 seconds into the third quarter with a sensational diving shot. Again, the Seals went on a run to answer, scoring three goals in 1:29, including Buchanan's fourth of the night. The Seals were then denied a goal upon a video review, and that seemed to give the Rush some life as they answered with four goals in just over five minutes. Shattler took a flip pass from Matthews and rifled a shot in to make it 10-7, and he then inched the Rush closer as he stuffed a shot in after diving out from behind the San Diego net. Just 55 seconds later, McIntosh whipped a shot to the far corner to make it 10-9, and only 1:09 after that, he evened the game up on his hat-trick goal as he lunged out from behind the Seals net and tucked a backhand shot in. Former Rush Dan Dawson restored the Seals' lead on a power play with 3.7 seconds left in the third quarter, and it was a lead that San Diego wouldn't let go of. Church, Matthews, and Curtis Knight had the other goals for the Rush, while Shute made just his third career start. The Rush are back home at the SaskTel Centre in Saskatoon next Saturday when they host the Vancouver Warriors.